It’s okay not to know everything, preferable even. I had a little boy over to my home, a friend of the grands. I was making slushies, but my mixer wasn’t cooperating. The little boy was watching me mess up his slushie. He is a well trained, bright, sweet little boy. But he waited until he couldn’t stand it any longer. He blurted out “When you get done doing that, can I show you how to do it right?” I would have slugged him if I hadn’t been laughing so hard. I did tell him there was a reason for my mess and then I suggested that maybe he not know everything. That maybe it was okay not to know everything, no matter how smart you are. I have to tell myself that plenty. My profession sets me up to fail in that often. I am reasonably intelligent, and certain training allows me the joy of helping people. I love it. But sometime, I have to remember to keep my heart open for discovery, for serendipity, for unimaginable and remarkable things. People are often predictable. Not much surprises me these days. But there is plenty beyond my realm of imagination. Sometimes, my greatest lessons when I am spying out the land of a counseling terrain, is when I find out the land is full of giants. From then on, I know it will be an act of the divine to defeat them, to see victory. I also find that in my life of routine and mundane, I will miss the places where I have to make room for things beyond my human conception. Many people I know don’t believe it unless they see it or feel it or hold it. They don’t understand that they miss a great deal of growth. For life is often bigger than just you and I and our little corner of the world. 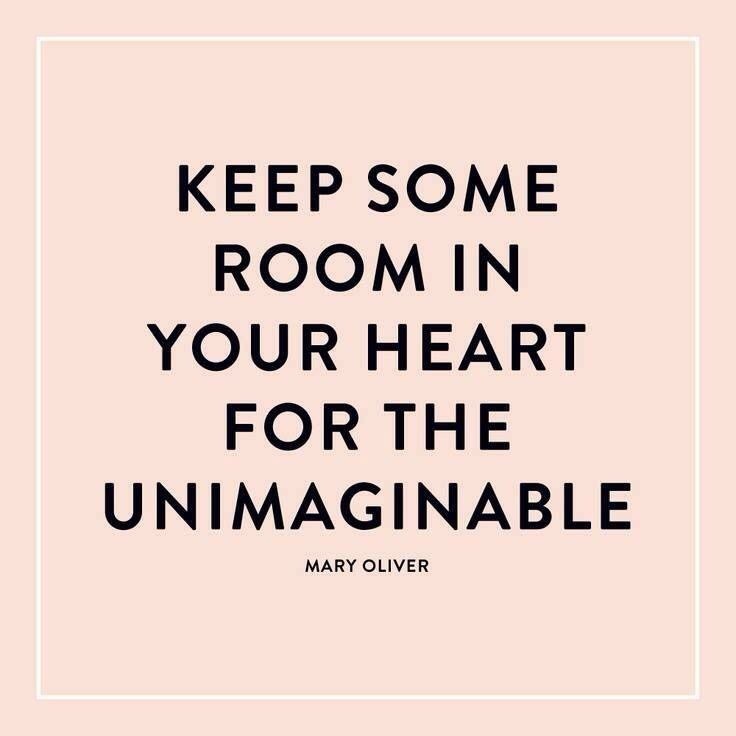 Always keep some room in your heart for the unimaginable, for the bigger and beyond, the smaller and the hidden, the trail you see and the one you don’t see. It’s a remarkable life. How much of our lives are lived on a public or outward level? Most people consider what they are going to wear because of where they work, what they do and what’s comfortable. Most people decide to live with or near other people. That means people are going to see what you do from the outside, looking in. We often develop skills with the help of others. We choose many decisions based mostly on how people view us or what we want people to think about us. But God calls us to the divine life that is lived from the inside out. Not in the way of inside, looking out, thinking we are outcasts or righteous elite. Quite the contrary, it is a life that transforms the outward of all we do. Developing our spiritual life is a discussion mostly formed out of a very private, unseen relationship. I’m not going to go to the park and see you and God playing on the football field. I’m not even going to see you and God sitting on a pew in a cathedral. But I’m going to see God through you from the way you live in the very private part of your life. I will be able to tell if your divine life is growing by the fruit you are exhibiting, by the way you talk, by the way you love. You don’t gauge divine living by what someone owns. You don’t see a person by what the give away, as much as by what they keep. I think of Samuel choosing the King God had chosen in the very quiet countryside of David’s heart. A nice parade of dashing young men, warriors and smart guys. As they each came before Samuel, he heard God reject them one by one. God reminded him that “Man looks at the outward appearance, but God looks on the heart.” But don’t think that means God just loves or chooses ugly people. King David might have been a scruffy stinky shepherd one day, but he was “good to look at” on the next. He was what you gals call “eye candy”, but he wasn’t chosen for divine positioning by that outward look. Neither are we. Nobody sees the heart like God does. No divine life is lived outside the divine. What others see is always a picture of our inside divine life. We can’t feign that. We can only imagine we are fooling others. But who we are in the dark, where no one sees us, outside the eyes of all others, is who we really are. What you are on the inside comes out in ways you may think are hidden. That is why, our spiritual life is invaluable to our lives. It is where we cultivate our real life. It is where we find our home. 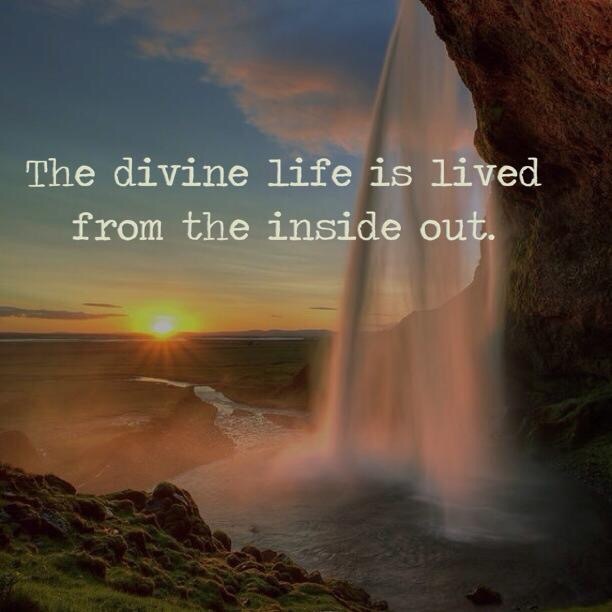 The divine life is lived from the inside out, not the outside in. Change is from the inside. Real power comes from inside. Love comes from inside. The divine life is tested in the places no one can know, but God. When we are real with Him, we are finding the truth. Live your life from the inside out. How does insecurity in your home affect your children? You might think this would be an obvious thing, but if it were, I think we would not be facing much we face today. Your marriage, no matter what it is like, will directly influence your children. It’s very important you get that in your spirit. Your patterns, your conflicts, your words, all become like a movie reel in their head, for the rest of their born days. Your marriage will be how they do marriage, which can be good and not so good. If your marriage is healthy and strong, true and faithful, nurturing and rich, your children will grow up excited about love and desiring good things. not always sure they want to try their own hand at it. For this reason, we are seeing redefinitions of marriage. They want marriage as it sounds in their fairytales, but they don’t want what their parents had or others they know. Children watch everything you do more than they listen to what you say, but that’s not to mean they don’t hear what you say. They do. How you talk to your mate will most likely be how they talk to their mate. If Dad was never home, they will likely marry a man whose seldom at home. If Mom was busy with everybody but Dad, they will likely marry a woman with outside interests. Children are greatly influenced by how a marriage functions in conflict. If your Dad was a yeller, you probably think that’s the way to do it. If your parents used a belt for punishment, you probably think that’s what you do. We rarely step outside our given tribal laws to create our own, so generations continue to unilaterally imitate what we are given. Much of that can be a rich and wonderful heritage, but certainly not all. That’s not to say we can’t or won’t change. There are some brave souls who do and it can be a good thing. It can also be a terrible thing. Looking at what you were given with maturity involves respecting them for what they were given, and what they tried to give you. It’s respecting yourself enough to evaluate what needs to be kept or passed on. Many times, you will be called upon to give what your parents did not give you. It will be passed on. That is the way of life. Children who experience the constant fear of harsh punishments fear more than just the punishment. They fear the love the punisher says they have for them. Or worse, the God who would allow such pain. Children who are neglected will always feel a certain amount of surreal in their being, as though they are invisible to other people too. Children affected by a quarreling marriage find they are addicted to drama. In every conflict, they default to it, unless they train themselves to overcome it. Children who are raised in marriages where there is no security, reek of insecurity. They may be boisterous and obnoxious just to feel okay. Children where marriage had a demand of perfection will feel they never measure up. Children whose parents involved them in adult expressions of marriage, find themselves adulting others without respecting them. Children who can’t figure out why their parents divorced believe it’s something they did. It will not matter that you tell them different. Children with critical marriages will be critics on steroids. Children with passive marriages will struggle to grow in life. Children in a narcissistic marriage will generally become the narcissistic parent, admiring their control. Children who are in a disrespectful marriage will not understand or value the wisdom of authority in their life. Children who live in frustrating marriages, will struggle at school, to hold a job and certainly in relationships. Do you see yet, why it’s so important that you create a healthy secure home? Of all places, your home should make you feel the most secure. You should feel that the minute you THINK about your home. If you do not, consider why and what you can do about it. I have had people tell me how they cringed to hear the husband’s car door or to get a phone call from a wife. How terrible that must be to live in such fear and ultimate pain with who you perceive to be a lover, friend and life mate. What are some danger signs of insecurity taking over your investment? Are you being honest in your relationship with your mate? If you aren’t being honest, you have made them doubt your integrity. If they have caught you in a lie, you have just taken a brick out of their security. You will have to rebuild if you can. If you have talked a good talk, but not walked a good walk, don’t expect them to believe you. Ever. Again. Even if they take you back, say they forgive you and are kind enough to keep you, don’t mistaken that for the purity you once had with them. You will need to become ruthless in your integrity, then maybe the miracle of time and trust will birth great things for you. If you aren’t believed, there has been a breakdown in communication. The best way to have someone trust you is to be trustworthy. Period. Another danger zone is hearing and listening and responding. If you aren’t hearing them, they realize they aren’t worth listening to and will begin to mistrust you. If you don’t respond, they know you are not listening and soon the roots of insecurity will have them convinced, they are unworthy to be heard. Another big thief of security, is sharing common and private properties. If you are keeping money, schedules, phones, friends, passwords, daily connects from a mate, you are quite possibly scaring them and scarring your relationship. Your mate should have access to everything in your life. And they shouldn’t ever need to check up on anything, because you will have already seen to it that they know. Every password, every account, every friend, co-worker, every time frame of your life is now to be eloquently shared. Marriage is a need to know basis. Now, if you are secure in your marriage, most of those things won’t be of any issue to you. 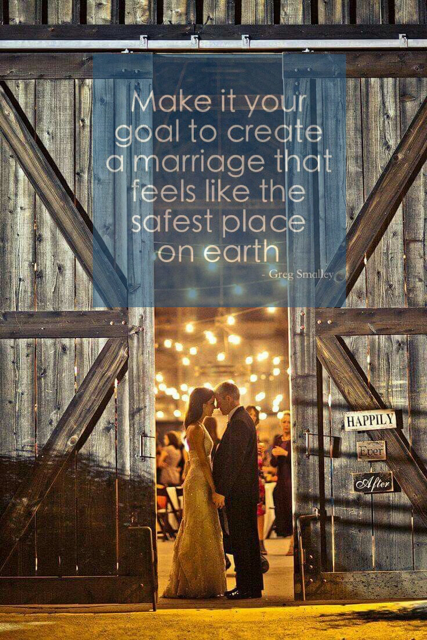 A secure marriage doesn’t check phones, schedules, etc everyday, or ever if the need never arises. But they are very aware its always available if they should ever want to see it. Nobody hides things without a reason. Watch what you hide from your mate. Tell them things that might make them wonder needlessly, if they ever found out. A very common alert in security breech is the living as one. Especially with the ruse of second and third marriages, this is more prevalent and harder to do. You should operate as close to one as two can do. Make decisions together. Don’t deceive yourself by thinking you are protecting them or don’t want a fight. If you do something inappropriate, admit it and repent. Let failures be redeemed and life be rich. Some of you will never have happy, because you are addicted to unhappy. Another red flag of insecurity is when you aren’t intimate with your mate. This makes them feel unwanted and unloved. It creates a vulnerable place for them to respond inappropriately to someone else. If you reject them, but say you love them, they stay confused and emotionally disabled. It’s a cruel thing to be in a marriage that plays games. Someone who loves you wants to be intimate with you for all the best reasons. Make intimacy a priority that simply hugs their security. Your communication is also a dangerous ground for insecurity to grow. If you ridicule, shame, and criticize on a too often basis, you are going to feel a great insecurity intensify. If you feel trapped, used and unloved, rage will begin to form. Maybe you don’t think anything of what you say to your mate. You are being funny or sarcastic, but it can drive a nail in a marriage coffin. Mates don’t forget what you say, let alone how you say it. As Scripture so beautiful exhorts us: Esteem others more than yourself. Is what you are saying to your mate building their self esteem? If it is, security follows. Another beware is if your job, family, church, social or recreation life, takes priority over your marriage and family, you are tearing down security. If anybody can just call you anytime and you can run off at their beck and call, you are going to face issues. If anybody can drop in on your family and not care about your schedule or time, you have a challenge. If you don’t limit things that steal from your relationship, expect to lose. Lastly, loyalty to your marriage is a distinctive part of security. Loyalty is a matter of honor, respect and love. For a friendship to remain intact, loyalty must be intact. And aside from being friends with God, your marriage is the greatest friendship of all. 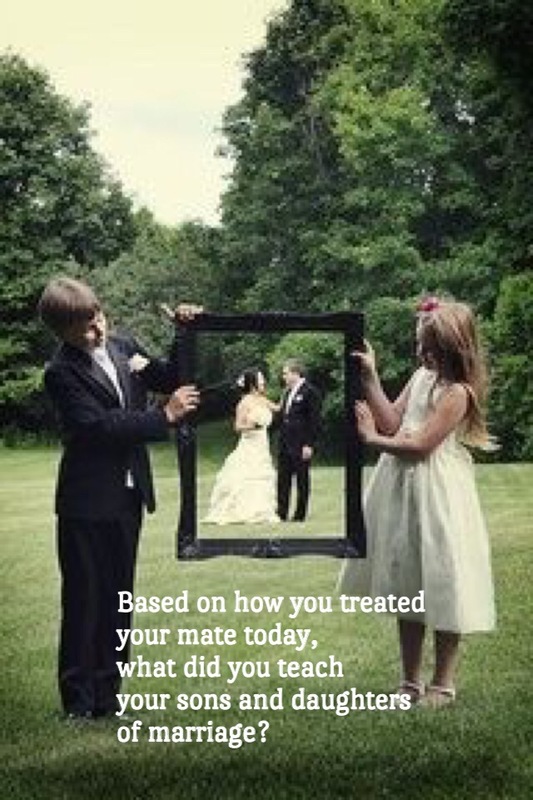 Some of you treat everybody better than your mate. This is to your shame and others lose respect for you, as much as your mate does. Love each other above all others, creating a safe and honorable home. How….do you build security in your marriage? There are two great guideposts that Scripture gives us on how to build security in our marriage. First, use the ‘golden rule’ effectively. Do unto them what you want done unto you. Speak the way you want to be spoken to and touch the way you want to be touched. Listen to them like you want them to listen to you. Spend time with them like you want them to spend time with you. That is the number one rule of successful security. Secondly, you must remember that we love people the most for how THEY make US feel. 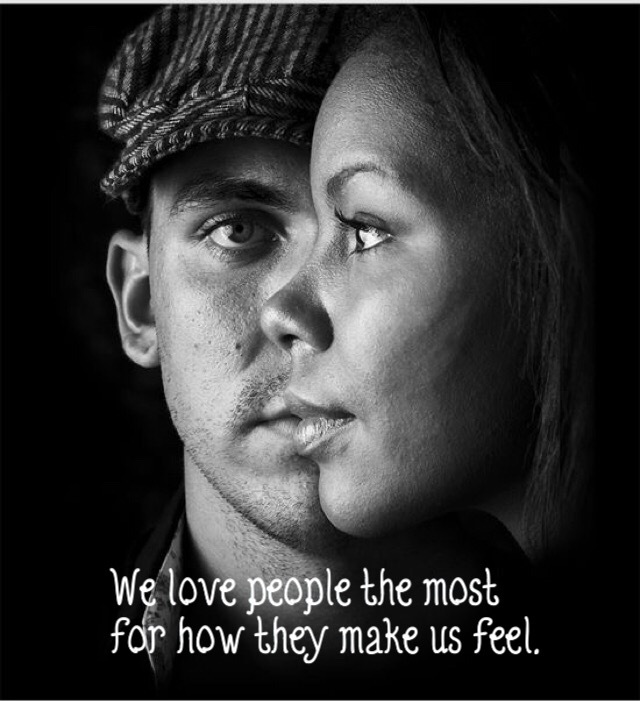 How do you make your spouse feel? Worthless, in the way, incapable, bothersome, fearful? OR loved, needed, valued, a priority, wise, fun, wanted? Gauge this by how you THINK about them on a regular basis, how you TALK to them and about them to others and what you are willing to DO for them. These are telltale signs of what is really in your heart. If your mate doesn’t feel secure, it could very well be, you have failed to make them feel secure. remember that love is always spelled with the letters t…i…m…e. If you don’t want to spend time with your mate, this is a sign something is wrong. When you don’t spend time together, you lose the emotional intimacy you both need. Your faith in one another lessens and you begin to feel anxiety. Your priorities should always be so established, so that others know what they are and don’t even bother to try and get you off track. Your boss doesn’t necessarily care about your time away from him, but he will care when your time is spent in destruction, because you bring that to your job. A good pastor will not ask you to sacrifice your home for the church, but there are few who will realize how spent people can be helping others. So, you need to be in charge of your own time. God would never ask you to walk away from the holiest of all work: your home. Bottom line, you…set the boundaries. An added benefit of setting strong boundaries is the respect others have for you. Another secret to building security is appreciation, thanksgiving, gratitude. The results of those acts is nearly immediate in building security in a marriage. So, they are imperative to do. They create a tenderness nothing else quite reaches. Now, if you act like you know their worth, but your time and other things don’t match, you are tearing down their security. If you do one without the other, they are not as effective and motives may be questioned. Value them in front of people, especially children, family and friends. Now if you say you value them and you aren’t giving them time, just because you give them stuff, you are going to lose ground. As nice as stuff can be, a secure joyful relationship always wins. Don’t let anyone talk about them behind their back. Don’t let anyone play you against one another. Otherwise, your secure walls are beginning to crumble. Get to know their love language. Make sure their emotional bank is full. Make sure you are connecting spiritually or else all else loses balance at some point. You can’t go wrong by asking yourself how to give the person you married joy everyday. You can’t miss it if you really want to do it. Go to work when you need to go to work. Keep a well ordered home, not a strict, authoritarian, overbearing home. They are not the same thing. Not knowing what the next argument or drama will be is creating insecurity. Work as on the same team with all things. Share the responsibilities as well as the privileges of money, home and work. You can split up chores, but if it’s all lopsided, somebody is going to feel it. Respect where the other person is while you are at work. Is it fair? Don’t take a job that takes you too much from your family, without talking that through and working out a plan for a season. Beware the pattern that steals all. I can’t tell you how many marriages die in the altar of this thing called a job. It’s rarely even a great job. So what if you make big money, if you have nobody cares or loves you in it? Even a good argument requires both of you, so quit being a lone provider or a lone homemaker. You have been divinely put together for a purpose. Challenge yourself to live that out. By divine design, God builds firm foundations and powerful infrastructures. Following His lead produces security and builds love. Interestingly enough, these are basic imprints on the psyche of our humanness. To not have these things, creates grave damage and is hard to regain. With the continuing war on our homes, I wanted to address this subject, trusting God to reach homes and change hearts. How do you build security in your mate? Why is it important to build security in your marriage anyway? After all, love is a day by day thing. Nobody knows if they can do a lifetime of love. We’re not responsible for the joy of others, right? Why do we have to create something for them? You are responsible for the energy, light and blessing you live. You may not be responsible for their joy, but you sure can appreciate the privileges of being joyful. You need human interaction no matter how awesome your dog may be. So, first and foremost, see the need for establishing security in those you love. If you define marriage as the sacred covenant, a commitment to being an example of Christ and the Church here on earth, then security is even more valuable. It also makes building security a very spiritual thing, which it is. Your home is holy ground. Building security in your marriage has the added bonus of strengthening everything in your life. Nothing builds security in your children more than seeing their parents love and serve one another. Security in the home creates better churches, schools, workplaces and ultimately, a better world. These places have all been affected by the dysfunction of insecure homes. I find it interesting that a book came out about how our dysfunctional homes were creating dysfunctional churches. 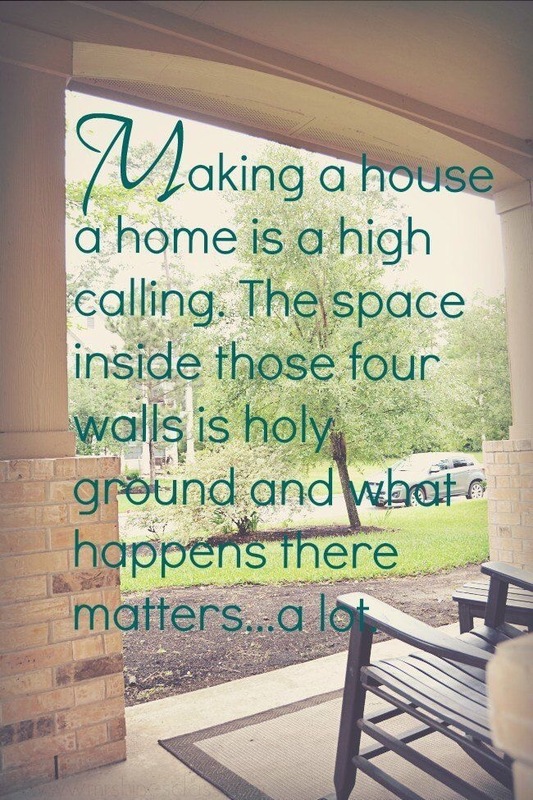 We recreate our homes given into every area of our lives. That is a sobering thought. Despite anything I have ever been told, what I have seen and what the record shows, is that divorce is not always the answer. It leaves everyone involved hard at work to overcome insecurity and anxiety that persist all their lives. we don’t like to talk about it, because it’s becoming so normalized. Still, it’s a harsh reality. Parents destroy children’s lives and rebuilding is never easy. So, it’s important to create security in those you love. This gives roots to your family. It protects them from every storm and a thousand windy days in life. It provides substance of faith. It teaches the currency of love that values all. It’s well worth your investment. The other night I woke up from a vivid dream of battle. All around me was dark, smoky, a loud smothering. It was crowded with bodies, clothed, unclothed, bleeding, wounded, dying and dead. The smell nauseating. but I was still walking, still upright, still bleeding, but feeling a strength I knew was present. God wanted me to remember who I am. I’m absolutely positive most of us forget most of the time, how much of a battlefield we are in, every single day. We do not clearly understand many risks we take with our marriages, children or even churches. We do not truly believe the Enemy is constantly engaging in attempts to kill, steal and destroy. Most of us are afraid of spiritual warfare. Or we just don’t believe in the depth of our faith like that. Or our carnality has kept us from seeing the powers and principalities which mask us from the battle. This does not, however, negate the war itself. Just because we don’t believe in a war, don’t think we see it in our backyard or only hear of it elsewhere, does not mean it isn’t happening right before our eyes as well. To be certain, most of us would faint in fear if we could see even a portion of the spirit world around us. and see the burning bush. This battlefield is holy ground. You won’t likely begin to fathom it’s magnitude, until it’s you, your home, your ministry, your health, your child, your family, your country…that is under attack. We are so untrained for battle, we often name spiritual attacks after things of our own doing, rather than knowing the Enemy has come after us. But then, when we finally have to wake up, it’s a rough ride. You begin to feel the heat of the battle, the dank stench of the wounds and deaths, the wails of the gasping moments. You see them all over the place. It’s overwhelming and you fear you are breaking down. 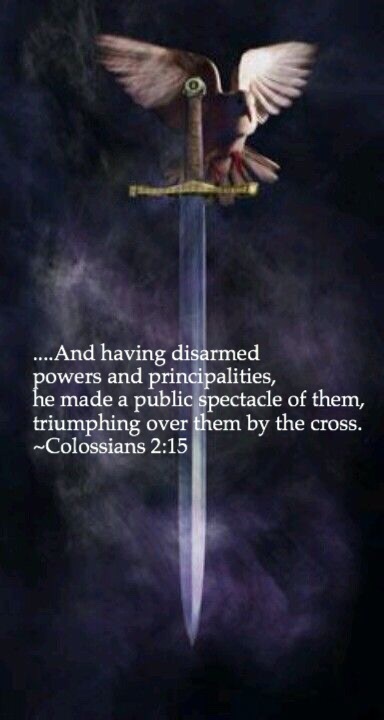 We will never disarm principalities and powers, without the Cross. You pick up that sword. You breathe deep and long. You beg the Holy Spirit to fill you up with a power not of your own. But you know it’s up to you to fight for that home, that child, that work, that will. but you get back up. You know the triumph was already won. This holy ground is yours. The battle comes to train you, not to strain you, not to drain you, but to empower you. How would you ever be a good soldier if you only played ball in the battlefield? The sword delivers a blow. It’s the blow that can disarm a thousand demons. God does not play well with those who would harm his chosen, called and faithful ones. He will make a spectacle out of that very thing that struck the first blow. It may cost us dearly. It may consume us until His fire consumes us. It may mean great changes, a great breaking of ground. But now, you are there. You can see it more clearly than ever you could before. You strive to caution others, but they don’t see it. So, you stand, falling and flailing and holding on to all you know to be true, because it’s proven itself. Whatever you lose, you were meant to lose. Whatever you gain, becomes greater than the loss. Having done all, you stand. The battle is never yours. Who knew that would be so hard somedays? A good soldier never forgets the battlefield awaits. While the battle belongs to the Lord, and our job is to sing glory and praise and honor unto Him, He will require we be available. Not to beg for deliverance, but to be strong enough to stand. That’s how He said He prays for us. So, when you are tired of standing, try to remember God is praying for you to be able to stand. Walk in the power of His triumphant glory.